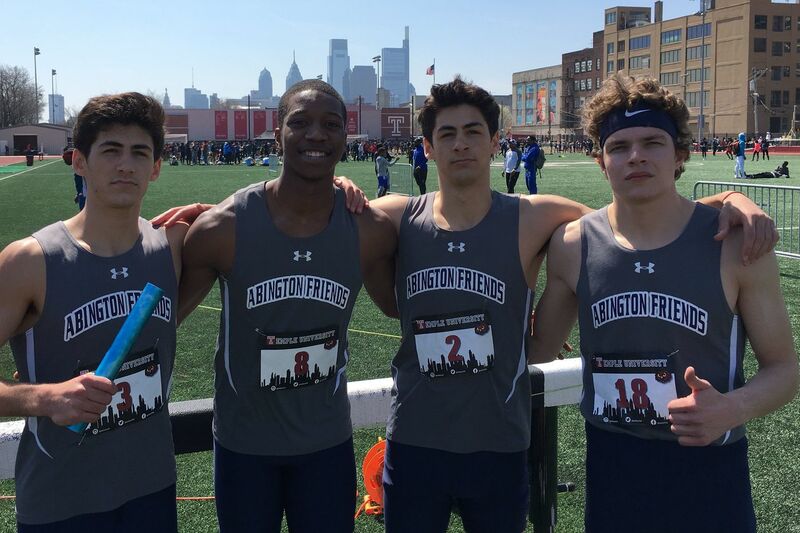 The Abington Friends 1,600-meter sprint medley relay team of (left to right) Jake Balick, Taalib Holloman, Chase Balick and Sam Shally finished first Friday in New York. Abington Friends seniors Sam Shally, Taalib Holloman, and twins Jack and Chase Balick finished first in the 1,600-meter sprint medley relay in 3 minutes, 37.7 seconds on Friday at the Big Blue Track and Field Classic in New York. That performance was the best time this year by a team from Pennsylvania, according to MileSplit. The foursome ran through rain and heavy wind to defeat several nationally-ranked teams, including Monsignor Farrell, MileSplit’s top-ranked team in New York. The Kangaroos just missed the qualifying time of 3:37 to compete in June’s New Balance Nationals. “The distance [the entire team] traveled in the three years since I got to AFS … We’ve come light years,” head coach Kyle Rankin said. Pat Toal’s three-run double in the fifth gave Haverford School some insurance in its 5-0 win over Father Judge. Calvin Costner led the Fords on the mound, striking out five through six shutout innings of play before Eric Hoyt came in to close the game in the seventh. Freshman Andrew Healy picked up his first career varsity win as Penn Charter beat Perkiomen School, 10-1. Healy threw three innings of one-run ball as Josh Felter followed up with three shutout innings of relief. Aaron Maione and Jake Siani combined for a 5-for-5 afternoon, driving in five runs for the Quakers. Joseph Rotella allowed just two hits through five shutout innings to lead Abington Friends to an 11-1 win over Academy of New Church. Zach Anderson, Josh Eisen and Kyle Conner all had two-hit days. Tommy Ball gave up one hit and struck out 11 en route to Shipley’s 3-2 victory over Friends Select. Antonio Rossillo drove in two runs and collected a double in his 2-for-3 outing in Archbishop Wood’s 5-2 win Truman. Hill School’s four runs in the fifth inning gave it a 12-2 win over Mercersburg Academy. Strath Haven’s five runs in the sixth inning lifted it over West Chester Henderson, 8-5. Methacton defeated Lower Moreland, 5-4, in eight innings. Hill School swept Mercersburg Academy in a doubleheader, 11-0 and 9-0. Tori Moran pitched five innings and allowed just two runs while driving in four at the plate in the first game. Jamie Auerbach went 3-for-3 with a home run and two RBIs. In the second game, Meghan Dempsey struck out 10 in a the complete-game shutout. She was also 3-for-5, while Nicole Fitzgerald went 3-for-4. Penn Charter lost to Lawrenceville (N.J.), 4-3, in eight innings. Mackenzie Bunnell’s two-run double drove in both of the Big Red’s two runs in the top of the inning. After a tightly contested first quarter, Perkiomen Valley went into halftime on a 5-1 run on its way to a 13-6 win over Crestwood. Connor Roor netted three goals and dished out three assists for the Vikings, while Jack Scaliti and Nick Steele combined for five goals. Gavin Tygh broke Penn Charter’s all-time face-off record during the team’s 11-7 loss to Lawrenceville. Team wraps up 3-game raodtrip 2-1 and are now 4-6 overall. Souderton put on a defensive display in a 5-1 victory over Harriton. Brock Azeff led all scorers with two goals as Nick Guthre and Luke Atiyeh both totaled four ground balls for the Indians. Justin Sanelli’s six goal day led Methacton to a 15-3 rout of Oxford. Wilson Krewson’s four goals helped Lower Merion get past Springfield, 10-6. Livi Lawton netted six goals including the game winner to lead Downingtown East past Methacton, 12-11, in overtime. Sydney Tornetta scored four goals for the Warriors, including the 100th of her career with her third of the game a minute before halftime. Mia Sheldon had a hat trick for Methacton. Penncrest was outscored, 7-2, in the second half against West Chester Henderson but held on to win, 13-12. Olivia Pritchard and Ella Tunnell combined for five goals for the Warriors. Abby Pennoni netted a game-high five goals for the Lions. Rachel Clark’s four goals led Conestoga over Archbishop Carroll, 15-12. Kellie Anne Matey had a game-high five goals for the Patriots. The Patriots had seven players score a goal. Garnet Valley downed Parkland, 16-5, after getting out to an 11-2 lead at halftime. Madi McKee had a game-high four goals. Kathryn Toohey and Kara Nealon both had three goals. Penn Charter outscored Manheim Township, 5-1, in the second half to complete a 9-8 comeback win. Mia Farraro’s three goals led the Quakers as Hayley Hunt collected 15 saves. Annika Nordhoy’s game-winning goal lifted Hill School over Mercersburg Academy, 8-7. Haverford high beat Bishop Shanahan, 8-5. Quakertown reached the finals of the Hurricane Invitational at Liberty High School but lost to the hosts, 2-0. The Panthers defeated Council Rock South and Abington Heights to go 2-1-1 in pool play. They then beat Berwick in three sets, 23-25, 25-21 and 15-12, to reach the final.